A man of many talents, he also began to design sets and costumes for the theater including Caroline Dudley Reagan’s La Revue Negre starring Josephine Baker in the show that made her a smash in Paris. Other shows included Androcles and the Lion, The Four Over Thebes, and the Garrick Gaities’ Rancho Mexicano number for dancer and choreographer Rosa Rolando (or Rolanda; born Rosemonde Cowan, and later to take the name Rosa Covarrubias). The two fell in love and traveled together to Mexico, Europe, Africa and the Caribbean in the mid to late 1920s. During one of their trips to Mexico, Rosa and Miguel traveled with Tina Modotti and Edward Weston, who taught Rosa photography. Rosa was also introduced to Miguel’s family and friends including artist Diego Rivera. Rosa would become lifelong friends with Rivera’s third wife, the artist Frida Kahlo. 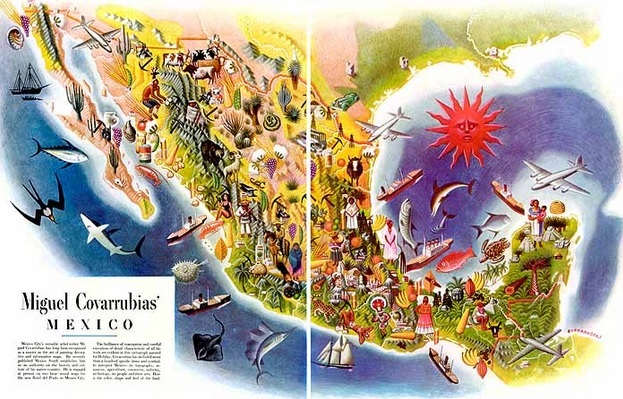 José Miguel Covarrubias Duclaud (Ciudad de México, 22 de noviembre de 1904 – 4 de febrero de 1957), también conocido como El Chamaco, fue un artista e investigador mexicano.